Please help me find my cat !!! 年齡：10個月大 age: 10 month old. 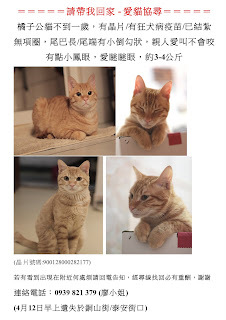 lost location: Taipei, ChongChen section, TongShen st.
Eggmond the Cat - Looking for that special loving home! Eggmond is believed to be another victim of a hit and run. He was spotted by a kind lady who feeds the local cats dragging his hind legs down the road. She quickly picked him up and took him to the LCO clinic for treatment. He is unbelievably friendly and loving. His legs have been badly injured as has his tail. He has under gone an operation and is in good spirits. He is able to go to the bathroom by himself but at the moment is not able to walk. We are helping him every day to make his legs stronger and hopefully he'll be able to recover and start to walk, all be it a little funny. If he is unable to use his hind legs at all we will consider amputation.